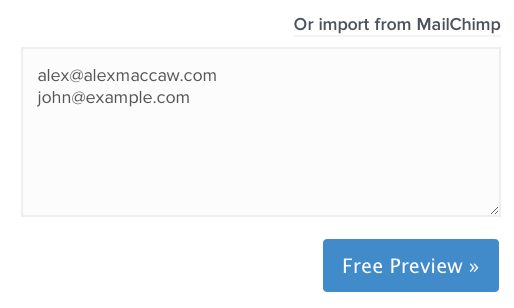 We're excited to announce Mailmatch, a service for getting social data from your email lists. Simply upload an email list, either by pasting a bunch of emails or by using our Mailchimp integration, and we'll search publicly available information from all over the social web to augment your email marketing list with Facebook handles, Twitter followers and much more. As well as the information below, we also offer a CSV download containing many more attributes such as additional social profiles, company information, and job title. All the data is backed by Clearbit's APIs. If you'd rather process email lists on a continuing basis than in batch, we suggest integrating with Clearbit's APIs instead.